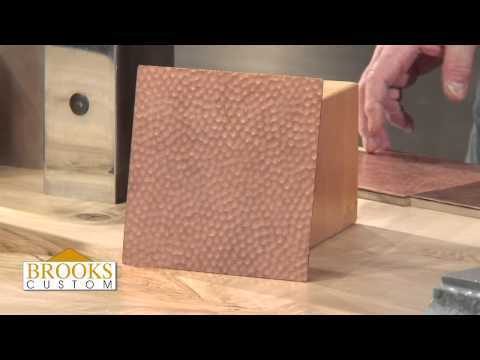 I'm Richard Brooks and talking today about copper countertops. Copper is a traditional countertop material, it's been used in Europe and the United States, really for centuries. It's bacteriostatic, it's a hygienic material. In a study, when staphylococcus germs were placed on zinc and copper and stainless steel, the germs were killed really first on copper. Copper is a great food prep surface and a beautiful, decorative metal. This example is of patinated copper, it's got a nice rich mottled color, and it's actually meant to get a pattern of use. It's in great shape being in a show room. Probably in real life, you'd see shiny corners on this and lots of color variation. This example is of a matte finish copper. That's raw copper, there's no lacquer on that, nothing to protect that, and it will turn a rich red-orange, and ultimately a dark brown in time. Copper, when used for indoor applications, will not turn green, that nice red-brown is what it really wants to become, from oxidation and from being in contact with various everyday foods. The finishes on copper: once again, this is our matte finish, this one has a patina, it's only molecules thick, it's meant to wear through, it's meant to develop areas on the countertop of greater darkness and less darkness. This example is of machine-hammered copper, so this is done by machine to simulate hand hammering. We've done lots of countertops in that, has a very nice look, it's affordable. This is hand-hammered copper; this can also be patinated. Hand-hammered copper is done the old-fashioned way, on an anvil, hammering both sides of the sheet at the same time. If you hammer only one side of a sheet of copper, it will turn into a bowl, so part of an artisan knowing how to hammer. This is quilted copper, so we're working with a press brake, putting a series of creases, we can do sunrise patterns and quilting. This is patinated and quilted. Many people make backsplashes with this material. So, how to make a copper countertop, we use 14-gauge copper, that's about a sixteenth of an inch thick, pretty much thick enough that you can't dent that very easily, very resilient, tough metal. We bend it downward and back under. The bottom back bend is called a return. It's then bonded to a water-resistant fiber core, where the bonding is 100%, leaving nice solid feeling rendition. Things that we make in copper would include countertops, sinks, range hoods, and furniture. They can be mirror-polished, they can be patinated, they can be hammered. Copper's a very versatile metal to work in, it's healthy, it's charming, and it's something the professional designer could bring to their project. It creates an old-world effect, it creates distress and charm, and really communicates a sense of heritage to a project that the interior design professional can bring to their clients' new work. Announcer: Brooks Custom creates luxury furniture and countertops from wood, metal, concrete and glass. Contact our expert design team for quality custom manufacture and delivery worldwide.